After witnessing how stormy sea set up is being filmed, we then board an open air tram and embark on a tour of backlot. Toward the end of the eye-opening ride, we then witness how the nature's fury through Catastrophe Canyon, where an earthquake, a flash flood and explosions surely delighted us. My son got scared when the tram started to shake and the water splashed on us. The special effects at Hollywood Studio can really bring so much fun for the family. After the flash flood special effect, Mr. Burrito said "Let's get our of here." 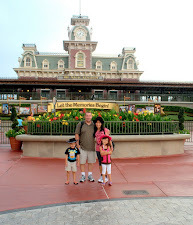 I still have a lot more to share next time about our fun-adventures in Disney. It would take a while before we could go back there again, unless we could find a great deal on flights to florida or find a great vacation package deal. what a fun adventure that is Sis, beautiful pictures too :-) Visiting from Color Connection Sis, hope that you can return the visit too. What a fun trip that would be. Seems all had a good time. hahhaha...t'was a cool experience...kala ko masusunog na tayo that time...lol! My kids loved that one! Thanks for the fun memories! Incredible adventure ride! Love the last view of the "rocks" looming above! I guess that's the only place where you can 'enjoy' natural calamities, lol. It may be too real and too much for Mr. Burrito's young mind. Visiting here for CC. what a happy and fun tour that is Sis :-) Visiting this time from Happiness Is...hope that you can return the visit too. i remember this part of the tour, even though i took it a very loooong time ago. it's fun, isn't it and not just for kids. Looks like fun for kids and adults alike! Oh this looks like a lot of fun had by all. Hope you're having a terrific day!! They still have that attraction - wow, it was one of my favorites from many years ago! looks like the girls are having a blast with the tour :-) Visiting from Ruby Tuesdays 2, hope that you can return your red visit too. You certainly have a lot of vacation photos. Every time I see you, you are on vacation.